For more than twenty-five years, Sweden’s Evergrey have been the preeminent purveyors of morose progressive metal. Tom Englund and company are known for their dense yet melodic compositions, drawing the listener into their dark and melancholic world. The Atlantic completes the band’s trilogy of albums focused on the overall adventure of life, which started with 2014’s Hymns for the Broken and carried on with 2016’s excellent The Storm Within. After Englund took a turn fronting fellow progsters Redemption last year, on their superb Long Night’s Journey Into Day, fans could be forgiven for wondering if that band’s relatively more upbeat approach to progressive metal would bleed into Englund’s main vehicle. Well, worry not, for The Atlantic more or less picks up where The Storm Within left off. “A Silent Arc” opens the album in thunderous fashion, and is the longest song on The Atlantic. It packs a ton of music into its eight minutes – quiet moments, chugging guitars, and plenty of dynamics. Once again, the focal point of Evergrey’s songs is Englund’s smoky vocal melodies, and he is in fine form here. “Weightless” is powered by a slightly more energetic riff, but still fits the band’s style of down-tuned guitars and airy keyboard lines. Along with its predecessor, “Weightless” is a solid song that has a lot going for it, but the high quality of these first two songs turns out to be difficult to maintain. Throughout the next five songs, which is half the album, Evergrey deliver nondescript numbers. While none of these songs are duds, they simply don’t stand out, and aside from “The Tidal,” which is a one-minute interlude, and the excellent chorus of “Currents,” a sense of sameness descends on the listener like an ocean fog. The final trio of songs has the band finding their footing once again. “Departure” is a standout track, the mellowest cut here, reminiscent of The Gathering’s “Amity.” It’s driven by an excellent bass line and delicate piano, and of course features Englund’s superb vocals. “The Beacon” is a keyboard-driven, climactic song, while closer “The Ocean” ends the album in majestic fashion. Production matches content here, making the songs on The Atlantic come across thick, murky, and at times oppressive. Englund’s voice sounds fantastic, and the bass tone features a ton of growl and crunch. The guitars are aggressive, as is the drumming, resulting in an album that truly delivers on the feel we expect when looking at the gorgeous cover art. 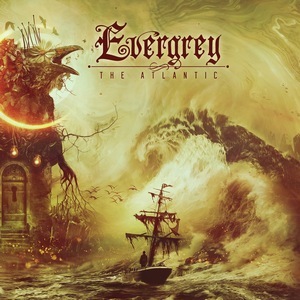 While the brooding feel and chugging riffs are Evergrey’s trademark, they can also be the band’s Achilles heel; after a time, the songs on The Atlantic start to bleed into each other, notably in the middle of the album. This is a good album that will be sure to satisfy the band’s fans, and is bookended by some excellent tracks, but The Storm Within set a high bar that The Atlantic simply can’t attain.